2003 wasn’t a particularly good year for Korea, or Pusan, the port city located at the southern most tip of South Korea. A strong-arm hurricane “Maemi” of an intensity not seen for five decades stormed Pusan, and its aftermath was still visible despite the city’s tenacious effort to erase all the traces of its wounds. A month after the mayhem, from watching television, listening to the traffic-control radio, reading local newspapers and talking to locals I could easily grasp how devastating the damage had been. In fact, everything was still spoken of in the present tense. Still, the Pusan International Film Festival (PIFF), now in its 8th year, delivered its much-anticipated program in spite of this ongoing damage control. The strength of PIFF was again (as it has always been) its willingness to embrace and its capacity to recognise quickly the emerging new talents and provide them with a commercially viable space. The Festival line-up included art-house films by well-known directors such as Bernardo Bertolucci, Gus Van Sant, Jafar Panahi (who was also a jury member for the $10,000 New Currents Award), Kim Ki-duk, Kitano “Beat” Takeshi, Kiyoshi Kurosawa, Tsai Ming-liang, and Peter Greenaway, but the PIFF’s real highlights and ace of spades were those lesser-known world-movies and Korean films. The cinematic unpredictability and anticipated mysteriousness in its selections are perhaps what constitutes the essential quality of a good film festival. Even when the movie finds you respectably bored, indefinitely impatient, uncharacteristically detached and indifferently sleepy, still the films could catch you hesitating between your sensibility and reason. In the end, you always learn new things about yourself. 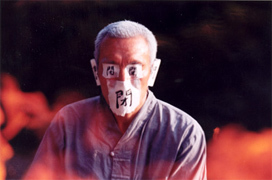 The opening film, Doppelganger (Japan, 2003) attended by the recent major festival favourite, Kiyoshi Kurosawa and internationally well-known actor Koji Yakusho, was screened at the resurrected Outdoor Theatre, which had been absent for three years. The narrative in Doppelganger, as the title implies, revolves around the struggle between a stressed scientist and his alter ego or split self. The film is laced with a good dose of suspense and horror but it is also blended with Kafkaesque existentialistic questions; the alter ego of the weak-willed and stress-prone scientist and the scientist himself try to live as two symbiotic units, each assisting and complementing the other. The theme of a split-self or split-personality is not a particularly new artistic arena, but the theme of an artificial-intelligence wheelchair for a handicapped as a metaphor for the physical realisation of human will complements the narrative as a fine philosophical study of human nature. The perennially doubled-edged nature of human will, the wheelchair which simply acts out its user’s will, and kidnap, blackmail, betrayal, greed, and highway robbery committed by characters in order to steal this wheelchair are masterfully arranged in the narrative. The scientist’s experiences during those tumultuous times are indeed a fascinating insight into the concept of human willpower, the realm of unconsciousness, and the compromise or rather reconciliation between greed and goodness. Doppelganger is essentially a metaphysical work by an author who consistently asks questions about the nature of society, and individuals trying to come to terms with their nature as social entities. 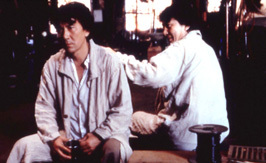 The narrative structure clearly resembles that of Charisma (Charisma, Kiyoshi Kurosawa, Japan, 2000), but if Charisma is a macroscopic attempt to view society as the razor-edged manifestation of the symbiotic relationship between dominant and dominated, Doppelganger is a microscopic attempt to view the individual as one fundamental unit which is constantly dominated by greed, unconsciousness, will and human goodness. In the “Asian Documentary” section, Hibakusha – At the End of the World (Hibakusha – Sekai No Owarini, Japan, 2003) is an inspiring documentary directed by Hitomi Kamanaka. Although “Hibakusha” is the term for the survivors of atomic bombs in Japan, the director here does not only apply the term to Japanese survivors but also to Iraqis and even Americans who suffer directly and indirectly from the destructive effects of nuclear fusion. The director emphasises their present life rather than delivering the historical recollections or their collective memory. We see their life as it is tremendously affected by their own world-weary memories, ever-failing physical health, the suffering of their family members who still live, and those who have died long before them. In fact, there is none of the customary imagery such as “Akira”-like spectacular mushroom clouds or the “invisible” damage done by radioactive contamination. This humane and modest documentary shows their struggle and suffering at a “respectable” distance. A strong sense of emotional detachment is not evident yet neither does it present a strikingly empathetic description of those “Hibakusha”. Nonetheless, one Japanese middle-aged man’s recollection while he is cooking wild sweet potatoes in a desolate outdoor scene is incredibly moving and sad. At a very tender age of six, he could do nothing but observe his parents’ and sisters’ suffering, leaving him as the sole supporter of the family, and in the end, orphaned and left uncared for. Another documentary in the “Asian Documentary” section was Spring: the Story of Hsu Chin-Yu (Chuntian-Hsu Chin-Yu de gushi, Tseng Wen-Chen, Taiwan, 2002). The film delves into the turbulent modern history of Taiwan through an old lady’s recollections, memories, conversations with old friends, and her own travels back to the places and times of her bleak past. Lyrically presented with songs, stage play and animations, we witness the same bleak period in the history of Taiwan following the Japanese Colonial Occupation, “the White Terror” under the Kuomintang’s dictatorship, and the 15 year prison sentence imposed upon her for her work in the labour movement. It is largely a sentimental and personal drama but the damage done to people portrayed in the film comes across as real enough although it isn’t particularly informative. The questions of socio-political and moral responsibilities are not overtly present, making the film an observer’s documentary rather than a judge’s documentary. In “A Window on Asian Cinema” section, Blind Shaft (Mang Jing, Li Yang, Hong Kong/China and Germany, 2003) is a painfully realistic portrayal of a miner’s life, and at the same time an immensely powerful drama. One might expect to identify with the miners and their plight, but the central characters here are not very likable, at least not until they meet their next victim. One of them is wracked with guilt over their plot to have him killed to profit from his death. It takes us to a place where sympathy and goodness are undermined by poverty and we then see how this undermined humanity is revived by the innocence and devotion of a young man. The conflict and particularly the ending are not far from unpredictable, but the sincere honesty in the plot, its hard-edged portrayal of a poverty stricken miner’s life, and the tension between three main characters makes Blind Shaft a fine piece of social criticism and art. In the “New Currents” section, Dancing in the Dust (Raghs Dar Ghobar, Asghar Farhadi, Iran, 2003) in a way takes us to thematic territory dealt with in Blind Shaft. It also deals with spiritual change as experienced by the central character. In Dancing in the Dust, a jaded and hard-boiled snake-catcher’s cynicism withers because of a naïve and hopelessly incompetent young man’s selfless-love for his ex-wife. Not having seen many Iranian films, I am not sure about its authenticity in its portrayal of a snake-catcher and other characters as Iranian cultural artefacts. The chain-smoking snake-catcher’s world-weariness reminds me of a good old B-movie hero who performs his one last good deed and then completely disappears. Somewhat disappointingly, the narrative does not bother with the socio-cultural details. It is a modestly well-made film about hard-earned humanism in a difficult time but it does not contain any particular social and political implications that Blind Shaft carries with successful subtlety. Still, Dancing in the Dust is moving and sublime in its rough portrayal of love in action set against the routine loneliness and cynicism so prevalent in these characters’ lives. In the “New Currents” section, the screening of Sedigh Barmak’s Osama (Osama, Afghanistan and Japan, 2003) was memorable in many ways. The first Afghani feature film produced since the end of the Taliban rule, it was a tremendously difficult task for the director and crew to make this film. It was also memorable for me to have watched the film in the presence of a great film director, Mohsen Makhmalbaf who, I later discovered, served as an uncredited producer on Osama. The film takes us into the life of a young girl in Taliban-ruled Afghanistan. Simply to work, and support her family she is forced to disguise herself as a boy, but she also ends up getting sent to school where she must lead her life as a boy. The film is not only a good social account of an Afghani girl’s life under the Taliban rule, but also a human drama about despair and hope. The simplicity of the narrative is interwoven with a suspenseful plot, turning the film into an almost three-act-like tragedy. Moving to the “Korean Panorama” section, Invisible Light (Geu Jip Ap, Korea, 2003) is the second feature by director Gina Kim. The narrative follows the troubled life of two women who are both related to the same man, as a lover and husband, who is never seen in the film. There is an obvious hint of the influence of modernism, with the director favouring long-takes and “undramatic” moments, rather than “short-tempered” close-ups and a linear narrative structure. It is essentially a mildly provocative observational drama, and despite its obvious low budget production and woozy cinematography, Invisible Light is genuine proof of the director’s talent and thoughtfulness. The contrast between the lives of two women is closely observed throughout the film. The first woman always stays in her house, resisting her appetite, and then losing herself in a frenzied bulimic cycle of binge eating and vomiting. Even her final attempt to leave the house is subverted by her own clumsiness. The second woman is always on the move, crossing the street, riding in a busy subway, moving from one cheap motel to another, and washing up in a public toilet. The use of numeric inter-titles is effective as an indication of their bodily conflicts as well as marking the undesirably interrupted moments in their life: the first woman keeps track of her weight loss and the other counts the days of her pregnancy. Another film in the “Korean Panorama” section is Kim Ki-duk’s latest, Spring, Summer, Fall, Winter…and Spring (Bom, Yeoreum, Gaeul, Gyeoul…Geurigo Bom, Korea, 2003). As always, the director delivers stunning visuals full of artistic originality, but coming from such an established and highly regarded filmmaker, Spring, Summer, Fall, Winter…and Spring is largely a disappointment. Given all of Kim’s films can be read as a parable one way or another, this particular parable loses touch with the reality Kim has portrayed so well in his other works. His parables have been so meaningful because they are full of realism, if not painfully recognisable details of Korean society and culture. In other words, his films, despite their grotesque violence and inexplicable gestures, have never lost touch with the harsh and cruel reality that Koreans must face every day. This time he ventures into the Buddhist territory – not into Buddhism – but in a rather curiously Christian way, as he admitted himself in his own guest talk. But the film seems to be no more than a package of stunning visuals without much substance. Sure, one can put anything into a film, but what distinguishes Kim’s works for me is his capacity to recognise the abstract conflicts and to enhance them with highly charged emotional imagery however ambiguous and enigmatic they are. This film, however, lacks the level of detail and engagement with the subject matter that usually characterise Kim’s works, and for me this makes the visual elements rather empty, striking though they are. It is conceivable that the film can work on a purely atmospheric level but with the use of the profound framework of Buddhism it is inevitable that the film becomes much less original. Artistic profundity competing with religious profundity lead to a dead-end, if not reducing the quality of the film to mere “exhibitionist profundity” which is in fact shallowness. It is a disappointing work from such a good director who happens to be one of my own favourites. In the “World Cinema” section, Maria (Maria, Peter Calin Neter, Romania, Germany and France, 2003) is a heartbreaking film about a mother who turns to prostitution to keep her household intact. This non-fiction based fiction confronts the viewer not only with the mother-turned-prostitute’s life and her family but also with the wide socio-political background and the implications behind them. It is a straightforward tragedy with the strong acting ensemble, shot with a rich sense of texture. Again in the “World Cinema” section, The Matchbox (Spirtokouto, Yannis Economidis, Greece, 2002) portrays a dog day summer where everything goes wrong in one Greek household. This intensely performed and intensely structured drama is exactly as its title implies: the Matchbox. I suspect it was shot on DV and then converted to 35 mm. This mildly experimental film is full of explosive moments, abusive dictation and ill-textured close-ups, and you start to feel sorry simply because you are there. The young student sitting next to me spent most of the time looking at her shoes. Still nobody gets their brains blown away in the film, and nor is there even a trace of blood splattered on the screen. Apart from its routine sections, there was “Cinema on the Borderline”, which was a retrospective for many unseen or hardly seen Chinese independent films, “Spotlight on Canada” which commemorated the 40 years of diplomatic relations between Canada and South Korea, and “Waiting for the Rainbow”, an honourable gesture to introduce and support the thirsty Afghanistan cinema. As for retrospectives and tributes, PIFF highlighted the cross-cultural action-movie master Chung Chang-wha, the late Iranian poet-filmmaker Forugh Farrokhzad, Swedish filmmaker Jan Troell and Romanian filmmaker Lucian Pintilie. Jan Troell also acted as Chairperson for the “New Currents Award” section. Details are indeed endless and there are more than ten films that do not receive consideration in this overview, if not for the fact that they are already well-known and that a good many other critics have written about them. Still, there are anonymously numerous films that I feel heartbroken to have missed but alas the infinity of temporal space exists only in Borges’ fictions. Sure, I could try to expulse my alter ego from myself simply to watch more films, but I would just hope that the human quality of my alter ego wouldn’t be as bad-assed as Koji Yakusho in Doppelganger. Overall, there are many films to see, but there are more films that will inevitably escape our attentive cinematic gaze. Jungyeob Ji studies Cinema Studies at Macquarie University, Sydney.